It's 7 degrees today. SEVEN. The only thing that can soften the blow of temps in the single digits, is a steamy cup of hot cocoa. 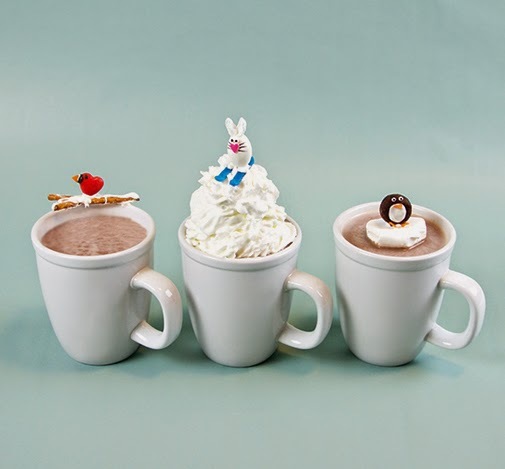 And the only thing better than a cup of hot cocoa on a freezing winter day, is a cup of hot cocoa topped with one of these cute candy critters. I'm especially fond of the little ski bunnies, swooshing down a mountain of whipped cream. But the penguins on iceberg marshmallows and the cardinals on snowy pretzel branches warm my heart too. Make some for a hot chocolate bar at your next winter-themed party. Or make some just for fun. You can find my tutorials for these sweet treats at Handmade Charlotte.